my darling pencil skirt: Chocolate&almond cake. Mix eggs, butter and sugar, then add the brandy, grated chocolate, vanilla, flour, baking soda and citric acid. At the end gently mix with the almonds. lay on a baking sheet, bake 15-20 minutes at 200C. 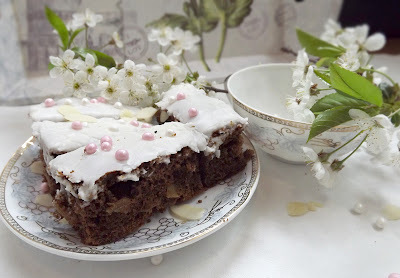 Then cool and cut into slices, garnish with icing and sugar balls.